Teachers and teaching principals complete this part of the survey. The Teaching practices questions focus on five important domains in terms of effective teaching and teacher inquiry in the current New Zealand context. What do the questions look like? Teachers also provide some information about their teaching experience, role, workload and morale. If the school is part of a Kāhui Ako, they answer a few questions about their experience of it. Teachers and principals complete this part of the survey. Teachers and principals answer questions about the way the principal leads the school. Principals also provide some information about their experience as a principal, and their workload and support they have for the role. 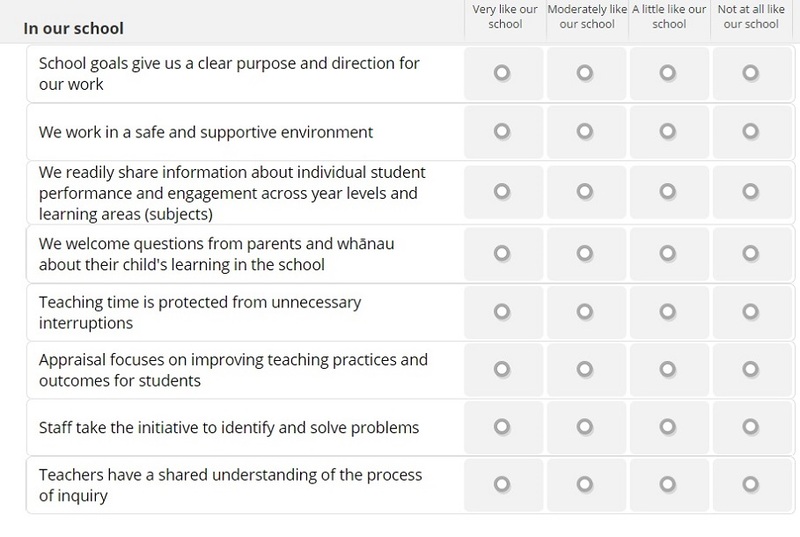 If the school is part of a Kāhui Ako, they answer a few questions about their experience of it.